Whistling Tor is a place of secrets, a mysterious, wooded hill housing the crumbling fortress of a chieftain whose name is spoken throughout the district in tones of revulsion and bitterness. A curse lies over Anluan’s family and his people; those woods hold a perilous force whose every whisper threatens doom. Caitrin is a young woman running from the horrors of her household. Her father has died, her sister has married and gone and all she has left are kinsmen who are abusive to her both mentally and physically. Under their abuse Caitrin has become a ghost of the strong scribe her father taught her to be. It is a dreary, cold evening as Caitrin ventures toward Whistling Tor, a secluded village which houses secrets of its own. It is in this village that Caitrin overhears that the local chieftain is in need of a scribe who can read and translate Latin. Though the stories surrounding this chieftain and his household are enough to make any brave warrior wary, Caitrin believes this is her best hope of escaping her kinsmen who she believes will certainly come looking for her. Caitrin makes her way up to Anluan’s home and finds that it is a curse that plagues the chieftains of the Tor. A curse that no one believed would ever be broken, until Caitrin came. Caitrin comes to love the Tor and its inhabitants and with her hope she acts as a beacon of light to those plagued by centuries of darkness. The setting of this book was something I was very interested in. I love Juliet’s Sevenwaters series and adore that it centers on the forest, however, I was happy to find a more unusual setting and time period. Another significant change in this book was the element of magic. True, all of Marillier’s books focus on magic in some way but most center around “Other” magic, whereas Heart’s Blood is rooted in dark human sorcery. Caitrin must do her best to unravel the mysteries of the house and find a way to break the curse in order to help the friends she has come to love. Another difference in this story is the way Caitrin must go about breaking the curse. 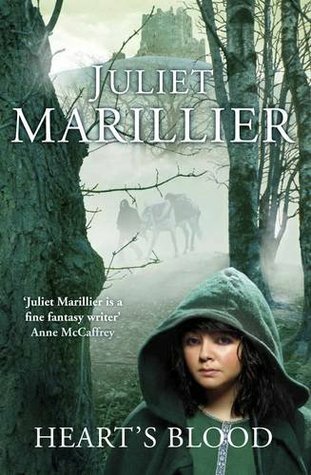 In many of Juliet Marillier’s books the central female character must overcome certain tests usually given to her by Otherwordly beings. In this story it is a much more direct approach in which Caitrin must educate herself on the past wrongs done by the chieftain’s and arm herself with knowledge and strength in order to defeat the evil still dwelling there. Though I absolutely love reading tales regarding the “Old Ones” I also really appreciated the way this story was a tad more paranormal. The secondary characters in this story were so fantastic I can hardly describe them. Some were rather creepy, the mysterious Muirne gave me a chills a few times as did the ethereal child who became attached to Caitrin and cried when she was left alone. Eichri and Rioghan were dependable and quite funny. Fianchu, whose name means “hound of a warrior band” was a huge, sweet and mysterious dog (think Dire Wolf) that I loved immensely. One cannot forget Magnus who was like a father to Caitrin and though very strong and dependable had an immense heart that showed throughout the novel. As is her style, Marillier included some dark elements to the tale that really drew me in as a reader. I was invested in the characters, I felt their pain and disappointment as they did and found myself on the edge of my seat hoping for a happy ending. Reminiscent of Son of Shadows and Heir to Sevenwaters, both Anluan and Caitrin have things to learn and many ways in which they can grow. It is Caitrin’s strength that shows Anluan how to be a good chieftain and defeat the evil taking over his heart and home. Anluan helps Caitrin grow back into the woman she used to be before her father died. As many of you know, Juliet is the queen of slow burning romances. This story did not disappoint, every look and small gesture radiated with something more and as always, Marillier broke my heart a little just to put it back together. Heart’s Blood was an obvious choice for me, Beauty and the Beast rewritten by the master Juliet Marillier was sure to be a hit in my mind. However I am always wary reading books by an author I love because my hopes are so high I fear that they will never be met. Thankfully, Juliet Marillier made my heart sing per usual. She stayed true to her path of weaving so many elements into a beautifully layered story. She creates friendships between characters (both human, Other and animal) that bring tears to my eyes and warmth to my heart. This book comes highly recommended; it is an absolutely unique and gorgeous retelling of an age old tale. For those of you who have read this and are looking for another retelling by Juliet Marillier, check out my review of Wildwood Dancing! This entry was posted in Adult, Reviews and tagged fairy tales, fantasy, magic, paranormal, retellings, supernatural. Bookmark the permalink. OMG. So. Somehow I didn't know this was a retelling of Beauty and the Beast until you posted your review, but now that I do I MUST HAVE IT. I want to read it even more than Wildwood Dancing. Do you know how this series will go? I'm assuming they'll be like companion novels since that seems to be Marillier's style?I love love love just the name Whistling Tor. It makes me feel cold and damp and think of fog. Can't wait, great review! I actually didn't know this was a Beauty and the Beast retelling until right before I read it!! It is definitely a loose retelling in the sense that the castle is not what it seems, there is a curse and Anluan is "beastly" in his own way. I actually think this should be your first JM book, I LOVE her Sevenwaters series but book 2 and 4 are the best in my opinion and I know you aren't going to be able to read the whole series in one sitting. I haven't heard anything about any other books in this series though if she would write others I think they may be actual sequels and not companions it was somewhat set up that way. Though she also sets it up to be a standalone which is okay as well!Also, Whistling Tor is totally cold, damp and foggy. This book was definitely a little more eerie and paranormal than her others!